My workout began a good two and half hours later than normal yesterday. If you are a runner, or even just an insanely routine person, you understand my thoughts on this without me needing to explain any further. I chose to run a few miles on the treadmill broken up with strength training sets in between. I love my outdoor runs but I needed these miles on the treadmill to remind my legs that they belong in the 7:00 min/mile pace group in two weeks. My mind has been so busy wandering off in the fresh air most mornings that hitting the pace I want has become an afterthought. Would you believe that my horoscope is still stuck on the same theme as last week, day after day telling me to follow my heart and let my intuition guide through all areas of life. If you are Gemini, this means you too. The more I keep reading about it, the more I think about it. As someone who totally follows their heart 99.9 % of the time, I have come to realize that my intuition is some sort of middle man between my heart and my mind. It takes into account my feelings but puts them into perspective based upon those previous experiences that my brain has stored up and likes to shoot back at me every time I have a decision to make. When you want to trust your heart, your brain chimes in to remind you of past situations, future possibilities and all sorts of what-if scenarios which may only leave you confused and unsure of how to proceed. If you recall last fall, I made the decision to pull out of the Hershey Park Half Marathon and a few other races because I just wasn’t feeling it. My brain thought I was insane when I called the Hershey Lodge to cancel the hotel reservation. Who cancels a race in Chocolate World? Who runs every morning, signs up for a race months in advance, makes a hotel reservation to only cancel it all including giving up the chance to receive handfuls of chocolate thrown at you when you reach the Mile 12 aid station? But my heart just wasn’t into it. I couldn’t fully explain where the lack of racing desire went but I really didn’t need to; something inside of me just wasn’t feeling the race therefore I wasn’t running it. I know I made the right decision. With the Fitness Magazine half marathon only two weeks from this Sunday, I am happily anticipating race day, which is a totally different feeling than I had back in the fall. 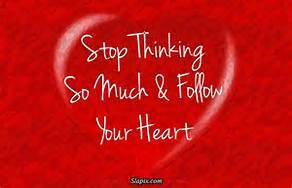 I think I often choose to follow my heart because to me, that means passion is involved. If I am not passionate about something, it just isn’t going to happen. Of course, there are times when big decisions really need to be made and you find yourself at a crossroad between the sounds of your heart, intuition and brain. What the heck do you do then? I don’t really have a straight answer to this question. 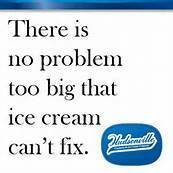 And when I don’t have the answer, that’s when I stop thinking and head for ice cream. Seriously. Like a simple vanilla soft serve with chocolate sprinkles piled into in a cone where you need to focus on licking the sides so that the sprinkles don’t begin to fall as the ice cream starts to melt all over your hands. Sometimes taking the focus off of the issue helps you to see the answer clearly. Or, just reminds you to simply follow your heart. Be sure to check out what everyone else is thinking about today! Do you make decisions easily? Ever pull out of a race just because you weren’t feeling it? Last time you had ice cream in a cone? I am so glad I could help today! I absolutely listen to my gut, especially when running. If my gut tells me to slow down or take it easy, I listen and never regret that.I have learned the difference between my gut reaction and just my legs not being in the mood. I can push past my legs but never my gut. I tend to overanalyze EVERYTHING, which makes for a lovely stress case 🙂 Hm, thanks for snapping me into place and realizing the MORE half is only a couple weeks away. Let’s just say this one is more for fun as I’m not completely enthused with my training and neither are my friends who are running with me 🙂 In that case, we are just going for the thrill of it rather than pressure. We definitely have to plan to say hi at the race! Nothing wrong with running for the thrill, so long as that gives you a thrill. Back in October, I didn’t want to run the race regardless of pace, thrill or chocolate. So strange but I am glad I didn’t make myself. I love how you followed your instinct on that. We will have to meet up! 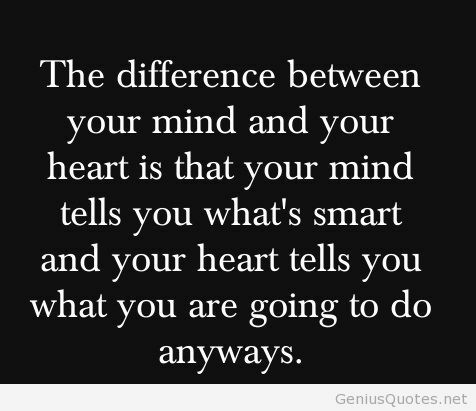 I can’t even think of the last decision that I made more with my head than my heart. Is that weird? I just know that anything purely based upon my head would never be the “right” decision for me. A good list of pros and cons is a great way to make a decision. For sure. Oh yes, I’ve been there. I’ve never pulled out of races because I just wasn’t feeling it, but I’m pulling out of my race this weekend knowing that I could probably run and finish, but then risk being out for much longer. For me, it’s more about deciding if it’s a smart decision to make in the long run. I’m the same way though- if I’m not feeling it, I’m not going to write/do/eat something. Lately, I’ve been all about that with food. I wasn’t feeling like a regular lunch, so I ate pumpkin bread. I wasn’t feeling like a milkshake last night (I KNOW!) but I wanted an apple. I think we know what we want more than we realize, which is pretty cool.